I know. I don't like diagrams much easier, but please humor me. This one might be useful, so bear with me. The extant written teachings of Buddhism, so I am told, are an order of magnitude greater than any other religion. Although the number of volumes can vary by the particular translation, the early Pali Canon contains some 40 to 50 volumes, the Chinese Buddhist Canon is some 80,000 pages, the Tibetan Kangyur is about 108 volumes, and the Tibetan Tengyur (commentaries on the sutras and tantras) is some 225 volumes. In other words, there is a lot to read. In Tibetan, these huge libraries have been compiled down to the essential Vajrayana teachings, which still comprise many, many books. And these Vajrayana teachings are themselves boiled down to what often are called the 'pith" or essential instructions. It seems natural that those of us who don't devote a lot of time to studying dharma would gravitate from the extensive works (that take years to study) to the condensed works, and particularly to the absolutely essential or pith instructions. The problem is that condensation removes more and more of the explanation, leaving what amount to simple pointers, and finally even those pointers become shorthand (almost ciphers) -- pure code. Those who already have spiritual realization are said to be able to read the pith instructions, which are like freeze-dried dharma. Just add realization and everything makes sense. What about those of us who have not had a lot of realization? The problem for me has always been to make sense out of the pith instructions. An example of a famous pith instruction is the "Ganges Mahamudra," the pith instruction that the Mahasidda Tilopa gave to his disciple Naropa on Mahamudra meditation along the banks of the Ganges River in India, and even that amounts to many pages, one single line of which is enough to occupy me for who knows how long. And then, finally, Tilopa is summed everything up in six single words, what are called "Tilopa's Six Words of Advice," the quintessential or 'pith of the pith' instructions, so to speak. In other words (no pun intended), the expanded Tibetan canon is several hundred volumes long. Just try reading that and keeping it all in mind from the first to the last volume, not that a good English translation even exists. Boiling it down to six words, I am sure we can all remember those six words, but what do they mean and how can we use such advice in daily life? It is analogous to having a fistful of consonants, with no vowels to expand them. 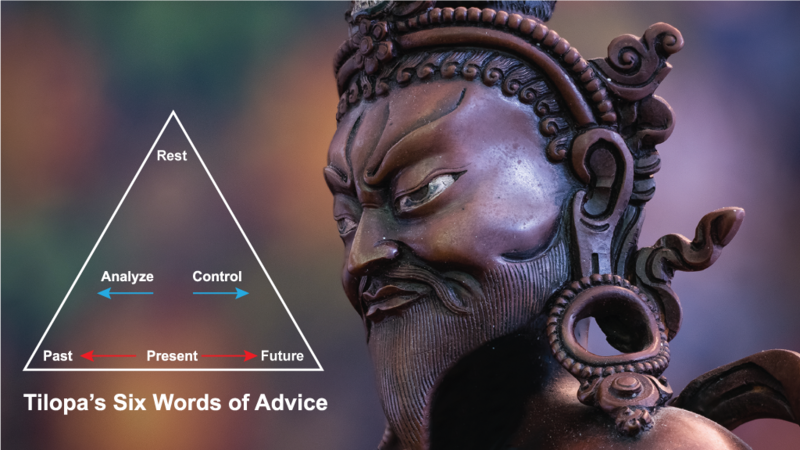 That being said, let's briefly (Tilopa's advice is brief) look at Tilopa's six words of advice with an eye to how they might be used by those of us just starting out. And, of course, I can only tell you how I go about using this advice. There are no doubt other approaches, I am sure. Let go of the past, rather than prolong it. Let go of the future, rather than invite it. Let go of what is happening now in our busy train of thought. Let go of analyzing, rather than figuring anything out. Let go of controlling, rather than trying to make things happen. Relax right now, just as it is. Luckily, those of us who are already learning to meditate have at least been exposed to the basic technique of Shamata meditation, learning to allow the mind to rest on an object -- our breath, a pebble, and so on. And when we find our mind distracted from the object of meditation (daydreaming or whatever), we simply bring the mind back to the object and allow it to rest there again. Meditation practice is endless starting over afresh, again and again and again, building in the present moment a new and hopefully more perfect past. This same technique, that of gently resting the mind on the object of meditation, is how I find Tilopa's six words of advice come in handy. The key for me (as with Shamata) is to be mindful of whatever I am experiencing, not just on the cushion, but all throughout my day. Let's go over Tilopa's six words of advice. Tilopa says not to prolong the past. If we become aware that we are lost in thinking about something past or nostalgic, especially obsessively, Tilopa suggests that we simply let go of that and allow the mind to return to the present and rest there. In a similar way, Tilopa says not to invite the future. If we become aware that we are speculating about the future, about what is to come, he suggests that we just let go of that and return to the present and rest there. The same is true for thinking about the present. Many spiritual doctrines say that the present is where we should be, as in the "Be Here Now!" slogan, you know, be present. Tilopa's advice is that we also let go of being concerned with present happenings as well (whatever is going on in our train of thoughts) and just let the mind rest. Those are the first three of Tilopa's suggestions. The next two, "not analyzing" and "not trying to make things happen" are, in my opinion, just variations on the first two slogans. "Not analyzing" kind of goes with the past, as in not trying to figure things out that have happened or are happening, and "Not making things happen" goes with the future, as in not trying to control or make anything happen. So the first five of Tilopa's slogans have to do with identifying and becoming aware of what we are doing in our mind and letting that go. This includes thoughts of the past, future, and present, along with attempts to figure things out (analyze), and attempts to make things happen (control). This leaves the sixth slogan, which simply is to let the mind rest just as it is. Relaxing the mind and resting is the essence of Tilopa's advice and also of meditation. It took years (decades actually) for me to understand that by "rest," Tilopa means the same thing you and I mean as rest, like: take a load off and just relax. It is my understanding that Tilopa's advice is for those who have had what are called the "Pointing Out Instructions" by a realized teacher. What good could they be to those of us who have not had the pointing out instructions, much less realized them? My understanding and experience is that these six words of advice can be very helpful to us even if we have not realized something yet about the true nature of the mind. Even with the pointing out instructions (and recognition), there is a lot of further practice that has to be done, years for most practitioners. And much of that practice has to do with being mindful and just letting go when we find ourselves caught in a distraction. As mentioned, this is done over and over and over. One of the wonderful things about Buddhism IMO is that it uses the present to make a perfect past. This is something anyone of us can do. We can begin that practice right now, whether or not we have had and grasped the pointing-out instructions, and all of our practice will not be wasted, but will only better prepare the way for eventual realization. In other words, we can begin to be more mindful right now; mindful of just what it is we are doing at any given moment during the day. If we find ourselves noodling in the past, in nostalgia or analyzing our past behavior, we can invoke the first and fourth of Tilopa's slogans, not to prolong the past and not to analyze and just let that behavior go and rest. Similarly, if we find ourselves speculating on the future, trying to control the outcome or make things happen, we can let that behavior go and just allow the mind to rest naturally. The same goes for busily following our train of thoughts in the present. Get off that train and give it a rest. Let the mind relax naturally. These slogans of Tilopa are not something just to consider or think about casually; they are calls to action, remedies for states of mind that we can find ourselves in. And we can invoke them anytime we are able to just pause and be mindful. I find myself doing it all the time, not just on the cushion, but all day long. I tend to use the six slogans of Tilopa as we might a site map on the Internet, to identify places I am likely to find myself in, and the answer or action is always the same. Let go of what I am doing and let the mind elastically return to its natural state and rest in that. Past, present, or future, the response is the same: cease and desist. Allow the mind to rest naturally just as it is and always has been.